Beck Row is one of the five settlements of the vast Mildenhall parish. It sits to the north-west of the town centre - more to the point, it is plastered along the northern perimeter of the vast American airbase. Of all the settlements, Beck Row has suffered the most. It has been turned from a tiny hamlet to a vast dormitory to the airbase. Its main street borders the northern perimeter fence, along which traffic hurtles recklessly. A week after I was here, an accident on this road would result in the death of a young woman and her three children. The noise of aircraft taking off is simply awesome - you wouldn't be able to get this close to a commercial runway, but people actually live here. Mortlock called the sound stupefying. As with the rest of the parish, the non-conformist presence here was a strong one, and a fine Methodist chapel faces directly on to the base. 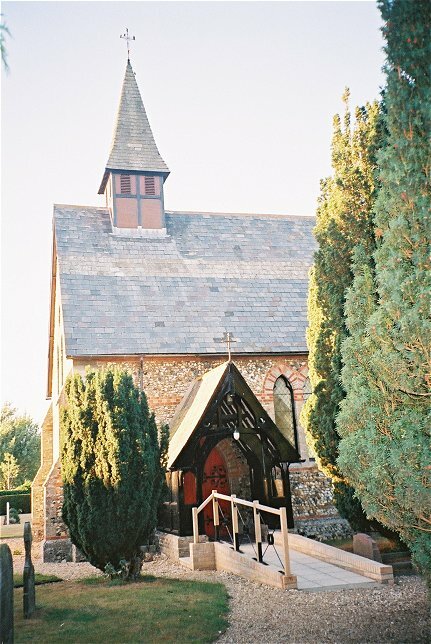 The Anglicans arrived in 1876; although Beck Row is not as big as West Row across the base, the church also serves neighbouring Holywells Row and, since the redundancy of its church, Kenny Hill. 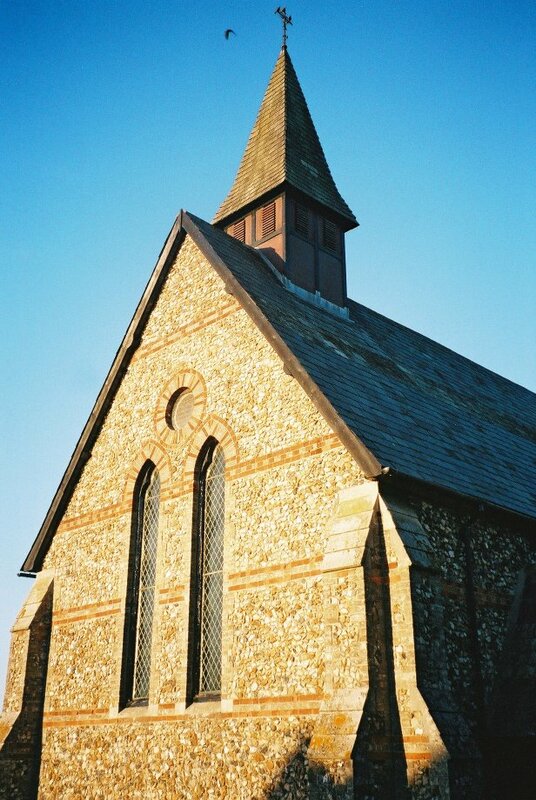 The architect was JD Wyatt, and Anne Riches, in her supplement to the 1975 edition of Cautley, is very disdainful, calling it an untutored and cheap approach to the Ruskinian concept of colour and texture. I actually like it a great deal, preferring the red and white banding used here to many other less colourful Victorian churches. Apparently, the inside had an elaborate decorative scheme using red and yellow bricks, but this was all whitewashed back in the 1970s when Victoriana was anathema. Apparently, the church also has the 17th century pulpit thrown out by Mildenhall St Mary when they had their Victorian refit. 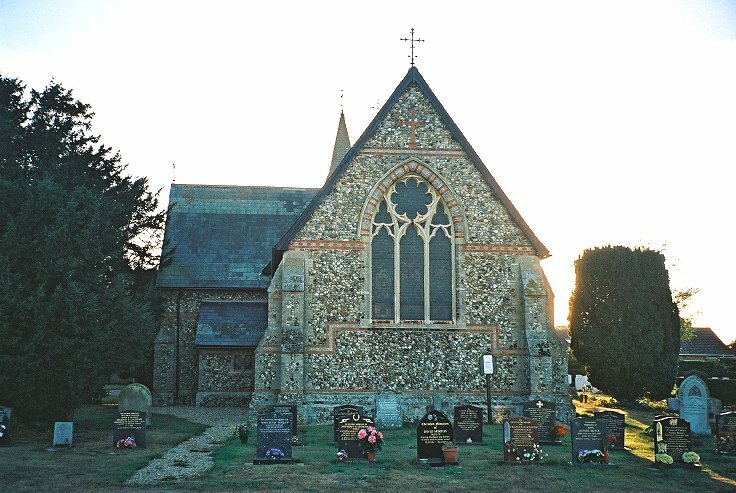 I arrived here at the end of the 2003 Suffolk Historic Churches ride, but everyone had already locked up and gone home. This was a shame, but I had caught the West Row welcomers leaving at 5.20pm, so it came as no surprise. If you are reading this at a participating church, it may be worth reminding your welcomers that the ride doesn't finish until 6pm. And I keep going to the bitter end. Also going until the bitter end was my camera, or so I thought. 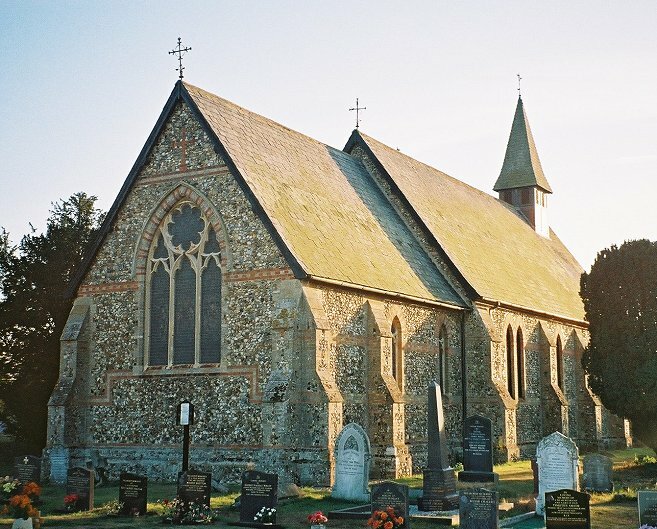 When I arrived here, I had only eight more Anglican churches in Suffolk to visit. I had hoped my camera would last out the whole county, and then I planned to go digital. However, here in this overneat churchyard it struck four times, and then never struck again. It was only the second camera I've ever used on this site. Its predecessor had died on a Cote d'Azur beach, the shutter mechanism full of sand. Camera number two expired in a less exotic location. Finally, I can't help reading this church's name without remembering the great John Beck, who managed my favourite football team through their finest hours. I'm not really sure why I told you that.